If you cannot find this ingredient, you can make a very close substitute by doing it at home in your own kitchen. Every manufacturer has their own secret recipe, so here is mine. Make your own and save some bucks. 1. Combine sugar and water in 2-quart saucepan. 2. Bring to simmer over medium heat, stirring just until sugar dissolves. 3. Increase heat to high and continue cooking until syrup reaches 200°F on candy thermometer, about 5 minutes. 4. Reduce heat to low, stir in remaining ingredients and simmer until garlic cloves are very soft and sauce is reduced by 1/3. 5. Let cool and strain into sterilized jars and refrigerate. 6. When cool the sauce should be very thick and very slow to pour. 7. 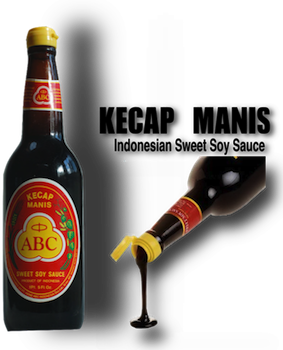 Kecap Manis will keep 2 to 3 months tightly covered and refrigerated. 1. Half-fill a large bowl with water and ice cubes and set it beside the stove. low and simmer for 10 minutes. 1. Make Ahead Tip: Cover and refrigerate for up to 2-3 months or freeze for up to 6-8 months.